A sophomore on the women’s swim team recently revealed to me that she and her parents talk on the phone three times a day. “I am always on the phone when I am walking,” she explained over a Foco dinner. “It’s nice [for us] to catch up for 10 or 15 minutes. We ask each other how our days are going.” Her logic, strangely, was easy to follow. I have no idea how I could possibly commit to that kind of frequent communication with my parents, logistically or emotionally. However, the thought of trying to replicate this routine with my own parents is tempting. I talk to my parents once a week, at least. And I find that I usually get out everything I need to say in our hour or so of talking. We never set up a precise time to call, and sometimes I am the one answering the phone. Over the course of the term I have started speaking to them on my Sunday evening walks around Occom. I am proud of my relationship with my parents. Our weekly check-ins are the least we owe each other, being on opposite coasts. When my parents were in college, they had to allocate time with their floormates to use the dorm phones. Having steady contact with me and my sister, now in her first year of college away from home, is something they appreciate in ways that I will never fully understand. My parents worry. I think most parents do. My parents worry with me about my classes, my swim practices (when they can understand them) and now, my post-graduation plans. Our talks are usually related to these kinds of uncertainties, but sometimes my parents and I wonder about my sister, who has always kept her distance. Or about vague Facebook posts of friends from home, or where kids of family friends are choosing to go to college. These discussions happen after we cover the usual bases of catching up with one another, of course. We always start with our social lives. We go over our plans, if we have any, and we recap past endeavors. My parents sometimes ask about my friends here, and sometimes I do the same with their friends. We then delve into my job search. I usually have some new application or interview to discuss. My parents offer their advice before I can ask for it. This used to bother me, but at this point I am used to it. I have to let them worry for me. Sometimes I worry for my parents, too, though not for any real reason. I blame that on the distance between us. I like knowing that they keep themselves busy without me or my sister around for distractions. I like seeing the occasional Snapchat selfies from my dad at the driving range or my mom in her office. Sometimes my dad sends me live updates from dinner parties, at which I automatically cringe. There isn’t a lot that is off-limits between me and my parents. I am thankful that we have that kind of relationship. But parents gossip, and there are things I don’t know about back home. I, too, have my share of topics that I decide to withhold. Navigating what to say and what not to say has gotten easier over the years, I think for all of us. I know what kinds of comments will upset them or simply bore them. 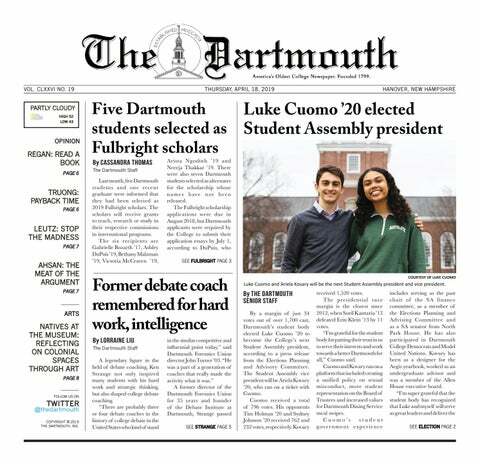 I am also more comfortable talking about things now than I was when I was first adjusting to Dartmouth. It helps that my dad went here. It also helps that my parents met while in college. They feel at home when they visit me, and they can relate to the pace of the quarter system. My dad was involved in his fraternity here, and we talk about the Greek system more than I do with most of my own friends. I enjoy relaying the latest and greatest for him and his Dartmouth friends, who I’ve always looked up to over the years. My mom wrote a letter to my grandma when she first met my dad. She visited my grandma earlier in the year, and she found the letter while rummaging through old belongings. My grandma is a bit of a hoarder — it’s cute. Over winter break, when we were all back together as a family, sitting at the kitchen table, my mom brought out the letter. The paper was as red as a Valentine’s Day heart, coincidentally. I could tell right away it was her handwriting, though a bit more polished than what I am used to seeing. I am not sure why my mom let me and my sister read the letter about my dad, but she did. “Man, I cannot believe I said all of that to my mother!” she said. My sister and I looked at each other and laughed.